We have a second trailer for the upcoming MBC drama Rebel: Thief Who Stole the People starring Yoon Kyun Sang (Doctors) and Chae Soo Bin (Moonlight Drawn By Clouds). 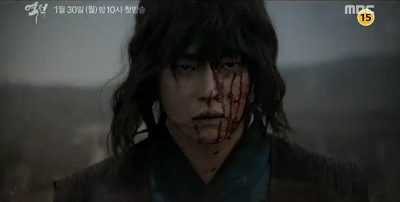 It shows a bloodied Yoon Kyun Sang taking on everyone around him. It also shows our crazy and tyrannical king, Yeonsangun (Kim Ji Suk) who will be pitted against Hong Gil Dong. It’s pretty intense! Rebel: Thief Who Stole the People is based on the classic Korean folktale about a man of illegitimate birth who steals from the rich to give to the poor and becomes a revolutionary activist in Joseon. This entry was posted in News and tagged Chae Soo Bin, Honey Lee, kdrama, Kim Ji Suk, Korean Drama, Rebel Hong Gil Dong, Yoon Kyun Sang. Bookmark the permalink. Aww, that’s too bad. It definitely looks like it has potential. It’s going to be a bit longer at 30 episodes, so even though I’m very interested in it, I don’t know when I’ll get around to it, hehe. Not sure this is my cup of tea yet but so glad to know Yoon Kyun Sang is part of another exciting project. His character in ‘Faith’ first stole my heart and his acting skills in ‘Pinocchio’ completely won me over. Hwaiting!! He really was great in Pinocchio! I’m interested in this one, but I’m not sure if I’ll get around to it or not because of the length. But either way, the cast is great and I’ rooting them on!